The Cathedral Church of St. George is nearly two hundred years old. It has a typical 16th century architecture with stained glass windows, wall plaques, a hanging chandelier and quaint adornments. The Cathedral is a special place to many people: a House of Prayer, place of History, a Sanctuary, a place of Solace where we experience the comfort of God’s Holy Presence. Now, the Cathedral needs your help. 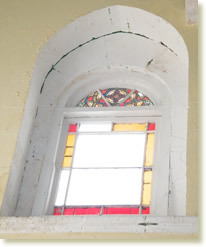 It has fallen into a state of disrepair that requires urgent attention. We have to restore it, and we have to do so now. Now, more than ever, our Church needs your help. 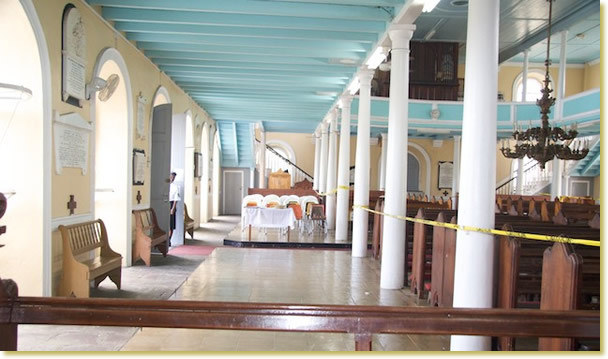 The estimate for the restoration of the Cathedral has been put at EC$4 million. Whatever help you are disposed to give to this charitable effort, it shall be thankfully received and faithfully applied to the restoration of our Cathedral. With the passage of time, termites have infested the Cathedral to the extent that key areas of the church are deemed unusable and dangerous to the congregation. The entire Cathedral therefore, has to be restored. Balconies: The balconies were constructed of timber, and have been subject to termite infestation and rot in the floor boards, timber joists and timber beams. Roof and Ceilings: The roof structure consists of timber trusses, timber rafters, timber purlins and close-boarding. The suspended ceiling was constructed of timber boards fixed to timber joists in the floor of the loft over the congregational area. Twenty per cent of the ceiling boards have suffered termite rot. Approximately ten per cent of the timbers in trusses, rafters and purlins have suffered damage as a result of the termite infestation. The existing roof cladding consists of corrugated asbestos sheets. The use of asbestos sheeting is prohibited in modern construction and the Control of Asbestos Regulations 2006 call for the controlled and supervised removal of existing asbestos material. Belfry: All timber floors in the bell-tower, as well as the timber frames which support the clock, are in immediate need of repair. Defective timber beams are presently embedded in the perimeter rubble masonry walls of the tower. The roof cladding of the belfry also consists of corrugated asbestos sheets. Timber floor supporting organ: There are five timber joists as well as the edge beam in this area which are termite ridden and are now structurally defective. Roofs and Balcony – Removing all ceiling, balcony, stairs and floors and replacing new roofs, floors and ceiling with hard wood. New materials such as Green Heart / Purple Heart / Kabakali and such other approved hard woods. The roof shall be cladded with new metal shingle. Replace all mouldings, trimmings and all decorative wooden designs. Rebuilding balconies, floors, organ loft and stairs using the materials mentioned, with terraced floors with original wooden decorations with materials mentioned above. Floor for Pews – Repointing, repairing and replacing material as original covering raised platform with 1” x 6” groove and tongue of similar materials as roofs. Windows and Miscellaneous– Replacing all wooden windows and doors with new ones as originals. New cupboards wherever existing, altar rails and all other separating rails with material as mentioned above. Electrical – Rewiring and placing in wall all conduits and cables as are required by the Government Chief Electrical Engineer. Modern lighting (period design) and sound fixtures. Walls – Sandblasting, repairing, repointing and refinishing external walls; scrapping, repairing and repainting interior walls. Belfry – Replacing floors, stairs, louvre shutters, repainting walls and all other furnishings; working and restoring all wood work around bells and clock. Altar Area– Altar area, vestry and washrooms restore as necessary with appropriate materials. Cheques and cash may be deposited to our account at First Caribbean International Bank. Donations may be wired to our account. Please contact us for account and Swift Code information.